Ferry Morse Seed Company know seeds and gardening because they have been selling garden seeds a long time! Ferry-Morse has been in the seed business longer than Burpee, longer than Northrup King, longer than Fredonia . . . longer than your grandfather’s father could remember. Ferry-Morse Seeds have been sold continuously since shortly before the Civil War. They know what’s good and what gardeners want to grow. There experience of more than one hundred and forty years of American history and American gardening are now at your fingertips. • Bottom Slits Promote Drainage and Strong Root Development. 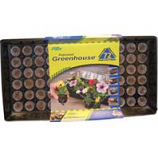 • Ideal For Starting Plants, Especially When Handled In Trays. • Easy To Fill and Easy To Break Apart When Ready For Transplanting. Ideal indoor start for a garden. Transplants directly into the garden or larger containers. Clear dome maintains humidity and warmth during germination period. Made in the usa. .
To Start Flower and Vegetable Seeds. • Growing In Jiffy Pots Eliminates Root Spiraling and Transplant Shock. • Plant Pot Directly Into Your Garden. • Jiffy Strip Seed Starter Pots. • Eliminates Root Spiraling and Transplant Shock. • Offers A Complete System In A Compact Size To Make Starting Seeds Fast, Easy and Convenient. • Includes 36 Jiffy-7 Peat Pellets, Base Tray and Clear Dome.